Whatever anyone may set out to do, if it is done with prayer the undertaking will prosper and he will be kept from sin, because there is nothing to oppose him and drag the soul into passion. If, on the other hand, a man leaves God out and gives his attention to nothing but his business, then he is inevitably opposed to God, because he is separated from Him. For a person who does not unite himself to God through prayer is separated from God. Therefore we must learn first of all that we ought always to pray and not to faint. For the effect of prayer is union with God, and if someone is with God, he is separated from the enemy. Through prayer we guard our chastity, control our temper, and rid ourselves with vanity; it makes us forget injuries, overcomes envy, defeats injustice, and makes amends for sin. Through prayer we obtain physical well-being, a happy home, and a strong, well-ordered society. Prayer will make our nation powerful, will give us victory in war and security in peace; it reconciles enemies and preserves allies. Prayer is the seal of virginity and a pledge of faithfulness in marriage; it shields the wayfarer, protects the sleeper, and gives courage to those who keep vigil. It obtains a good harvest for the farmer and a safe port for the sailor. Prayer is your advocate in lawsuits. If you are in prison, it will obtain your release; it will refresh you when you are weary and comfort you when you are sorrowful. Prayer is the delight of the joyful as well as solace to the afflicted. It is the wedding crown of the spouses and the festive joy of a birthday no less than the shroud that enwraps us in death. Prayer is intimacy with God and contemplation of the invisible. It satisfies our yearnings and makes us equal to the angels. Through it good prospers, evil is destroyed and sinners will be converted. Prayer is the enjoyment of things present and the substance of the things to come. Prayer turned the whale into a home for Jonas, it brought Ezechias back to life from the very gates of death; it transformed the flames into a moist wind for the Three Children. Through prayers the Israelites triumphed over the Amalekites, and 185,000 Assyrians were slain one night by the invisible sword. Past history furnishes us with thousands of other examples besides these which makes it clear that, of all the things valued in this life, nothing is more precious than prayer. I wish we could already turn to prayer itself; but we would rather add a little to what has been said, and consider how many diverse good things we have received from Divine grace, for the gift of which we should make a return to our Benefactor by prayer and thanksgiving. Now I think that, even if we spent our whole life in constant communion with God in prayer and thanskgiving, we should be as far from having made Him an adequate return as if we had not even begun to desire making the Giver of all good things such a return. 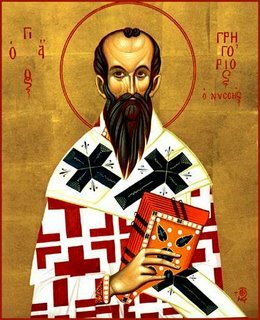 [On this day, the 26 Hatour in the Coptic Calendar, we commemorate St. Gregory of Nyssa, his blessings be with Amen.